The fields are alive with the sound of hymn singing! What does the phrase ‘sacred space’ conjure up for you? Last year I joined a large group of regular churchgoers from across Gloucestershire who were asked ‘where do you find God?’ Only a few said church buildings; the vast majority chose the outdoors. I suspect this is a British thing. Our varied climate drives us inside most of the time. We even travel around in enclosed metal boxes! Yet only a few generations ago we were almost all outdoors people. How else do you think we became world famous for talking about the weather? Although Christians do set apart certain places for worship (the word ‘holy’ means ‘set apart’), it is not because the rest of the world is unclean. Far from it: ‘The earth is the Lord’s and all that is in it’; ‘God loved the world so much that he sent his only Son...’ and Jesus was seen on mountains, in fields, by rivers and lakes, with people and alone. His most famous visit to a religious building involved turning the place over! All space is God’s space. It is not in church alone that we encounter him. We can learn a lot about space from monasteries. Visit one and you will find seven distinct spaces, each with an associated activity. Some are more obviously ‘spiritual’ than others, but don’t be deceived. Each one is important and can help us consider how we divide up our lives and perhaps show us a healthier, more balanced way to live. The cell (room) is where we meet privately with God and ourselves, the only totally private space. It can be lonely or a place of refuge. To be here takes courage and honesty. The chapel is public, shared space dedicated to worship, prayer and learning with, and for, others. There is structure here but also spontaneity. To be here requires discipline and patience. The chapter (meeting room) is where we gather to consider issues, where leaders and members hold each other accountable, where we can disagree. To be here requires humility and listening. The library is for gaining knowledge to benefit us and others. It is about transformation of mind and heart and requires openness and wisdom. The garden is not, as we might think, a place of leisure but of work. Here we connect with the world and our bodies and remember our limits. It takes willingness and energy. The refectory (dining room), where we enjoy the garden’s produce, is for sustenance (social, mental and physical). Here we meet to share, to practise hospitality, to serve and to be served. It requires generosity and self-control. The cloister (corridor) connects all these places and is itself a place of transition, where we change activity in an intentional way. It is also the place of chance encounter, with those we want to see or wish to avoid! Here we need self-awareness and trust. All the above places are sacred and therefore all are places of prayer, in which we learn to be loved and to give love. Where are these places in your life and that of our community? Are some missing or too small? Are some over-emphasized? Where do we need to do more work? What can we celebrate and wisely preserve? This will be our third year running the popular Alpha Course in North Cheltenham. Last year saw two groups – a total of seventeen people, including leaders – meeting to consider the meaning of life in a relaxed and informal way which included a meal, a DVD and a chance to chat. The Alpha Course first started 27 years ago at Holy Trinity, Brompton (central London). At first offered only to Church-goers, the course was adapted in the early 1990s by the then curate, former barrister Nicky Gumbel, who saw its potential for sharing Christian beliefs with those who did not go to Church. From this time on the popularity of the course grew and it quickly began to be used not only in parishes but also in prisons, hospitals, work places and the armed forces. Today there are over 33,500 courses worldwide in 163 countries and it is supported by all the major denominations. You can find out about the course by coming to the ‘Launch Supper’. The date for this has yet to be finalized but will probably be in the week beginning 19th September (watch out for details in the pew sheets and on our website www.northchelt.org.uk). Coming to the supper doesn’t oblige anyone to attend the course, but it does provide an opportunity to hear about what is involved and to think about whether to give it a try. No-one is pressurized to make a decision there and then, as the course usually begins a week or two later on, it is free to attend, it is ok to miss a session if you need to and anyone can drop out any time. If you would like to know more about Alpha please do get in touch as we are always keen to hear from people and are happy to answer any questions. We hope to have the tower open during the weekend of the parish fête in September (more details in the September magazine). This is to show you an interesting and historic part of the church that is unfamiliar to most and to encourage you to start ringing bells: we are short of bell ringers and often do not have enough to ring all the bells for services. There are four storeys in the tower. The ground floor is the choir vestry. Stone steps from the outside of the church lead to the first floor, where you can chime the bells. A ladder leads up to the clock chamber, and another one up to the bell chamber, where you can see the bells: the heaviest six bells are a complete set cast in 1748. (The tower roof is not available for access.) If you want to see the bells, come dressed to climb ladders. Ringing bells is a service to the church: we particularly need those in their twenties, thirties and forties likely to stay in the parish. It is a sociable, team activity. 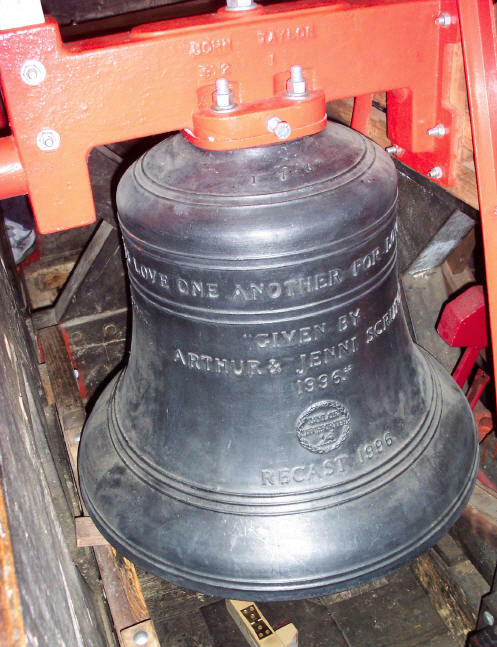 It is gentle healthy exercise for the body and mind: all the bells at Prestbury can be rung by men and women from teenage years to old age and there is always something new to learn. You will be sustaining a 400 year old English tradition, and you will be welcome at thousands of other churches and cathedrals, with amazing architecture and views. Tuition is free and there is no equipment to buy. You will get paid for ringing at weddings. If you join us you will need to attend practice on Tuesdays from 7.30 until 9.00pm and ringing for service on Sundays from 10.15 to 11.00am. If you want to try to learn to ring, at first you will be given lessons with a few other learners; these will be separate from the main practice and arranged at a time to suit you. If you want to continue, you will have learnt enough to join the main practice on Tuesdays after a few weeks. A few months after that, you will be ready to join us for ringing on Sunday. Children aged twelve or over are welcome, but we prefer to teach them with a parent or parents. This year we celebrate the 40th anniversary of the dedication of the ‘new’ church at St Nicolas’. The Dedication Service took place on 21st September 1970. We will be marking this anniversary on Sunday 19th September with a Thanksgiving Eucharist at 3pm in St Nicolas’ Church. We hope that some of the former clergy who have served at St Nicolas’ will be able to attend the service as well as former members of the congregation. You are all very welcome to join us. If you are still in touch with former members, please do invite them to attend. The service will be followed by a tea party in the Church Hall. A small group has been preparing a book to mark the 40th anniversary. The book will be a collection of memories of the early years of St Nicolas’, covering the period 1930 to 1970. More details of this will be available when the book has been published. There are four roles which PPY would like to fill with volunteers. If you are interested, or know anyone who might be, do get in touch with Jill Bradley, contact details below. Includes updating the website www.ppy.org.uk and extending on-line activities of PPY as relevant. Familiarity with website development and software packages is desirable, as is an ability to engage with young people. Includes maintaining notice boards in all the North Cheltenham Team Ministry Churches and researching ways to increase awareness of PPY and its work in the local area. Also issuing news releases when events are planned and building relationships with representatives of the local media. Good communication skills and experience of promotional activities are desirable. Includes researching activities and events to raise funds for PPY and promoting ideas to increase giving in the Church communities and amongst the parents of young youth group members. Experience of motivating and organising teams of people is desirable. Includes maintaining the membership register and other databases and producing relevant paperwork for funding bodies. Also assisting with the circulation of information as required and providing administrative support to other volunteers. Desirable attributes are computer literacy and familiarity with office/paperwork routines. In recent elections parishioners country-wide have mostly ignored them so the views of the mainstream of the church have not been fully represented. We only have ourselves to blame. Would anybody reading this like to be there at Lambeth to listen or comment and definitely vote on the things you really care about? Gloucester Diocese has produced a little guide explaining this system. Contact me for a copy and find out all about it. Visiting bishop Mary Gray Reeves of our Californian link diocese was invited to speak and told of the benefits of fellowship with us and West Tanzania, three very different forms of Anglican faith but now a rich and established spiritual link. Her greatest practical joy? Solar powered cooking pots! Dreamt up on a car journey, Silicon Valley know-how, Tanzanian manufacture, hard-pressed African woman’s joy. Put in the beans and rice in the morning, come home at night and supper’s ready! No fire lighting, no hassle, no burnt children. A life a little easier, and a real team project. The Rev Tim Mayfield of Christchurch spoke movingly about ‘The Kairos Document’, a plea from the Christians of Palestine. More of this to follow sometime. 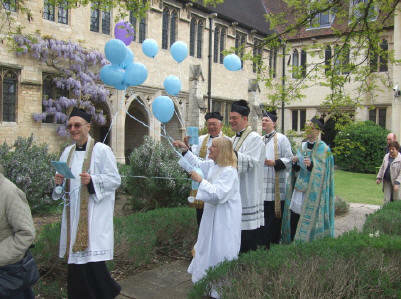 The Oxford May Festival saw the addition of a new role to the list of Diaconal duties: Balloon Bearer! What if the Holy Spirit had come down on Deaf Club instead of on the disciples in Jerusalem? That little scenario was presented to us by the Drama workshop at the South West Deaf Christians Together Pentecost Celebration in Wells in May. We had spent the morning in the Old Deanery, where I attended the Prayer workshop. We leafed through a selection of newspapers, ignoring the many pages of bad news, seeking out and then cutting out little snippets of good news. In pairs one of us signed ‘The Good News is …’ and then the other worked out a short prayer broadly based on it. Mine was that a particular famous couple were expecting a new baby. My partner then prayed for families, for children in difficult situations, and for couples who had no children. After a bring-and-share lunch (my contribution was two punnets of strawberries purchased in the previous day’s street market) we walked across to the Bishop’s private chapel, where we put it all together in a service. It is a lovely little chapel, and the fifty or so of us filled it. The different regions introduced themselves: Cornwall, Devon, Somerset, Bristol and Gloucestershire. There were four of us from Gloucestershire – two deaf members, me and the chaplain, the Revd Steve Morris. There were larger groups from most of the other regions. Why come together at Pentecost? Because it was when the disciples were together that the Holy Spirit came. We ‘sang’ signed songs; the Bible Study workshop signed a verse each from Acts chapter 1. My friend asked if she did her verse OK and I replied that what I saw her sign and what I heard the interpreter say were the same, so yes it was OK. The Craft workshop displayed their colourful banners, while the Drama workshop gave a lovely rendering of Acts chapter 2, with little flames, a rushing wind, everybody signing avidly in different ‘languages’, others suddenly understanding, someone signing ‘they’re drunk’, and the earnest response to that. And our workshop signed our good news prayers. The Rt Revd Peter Maurice, Bishop of Taunton, was the guest preacher, and there were two interpreters, one signing to each side of the chapel. It is nearly seven years since I first learnt British Sign Language (BSL) and, like any language, it quickly goes when you stop practising it. But being dropped back into the midst of a group of people with no other means of communicating really did me good. I was surprised how much came back, and I did more signing that day, and understood more, than I have in the last three or four years. On one of the recent warm sunny days in June, Michael and I went on a cycle ride. Just a short distance along quiet lanes from Hailes to Didbrook, Stanway, Stanton, Laverton and Buckland. Cycling through Stanton we heard an unexpected and pleasing sound of ‘Be thou my vision’ being sung. We paused and listened to a walking group gathered together in a field after their picnic lunch sing this hymn together. The fields were alive with the sound of hymn singing. We then continued on our way humming the tune. 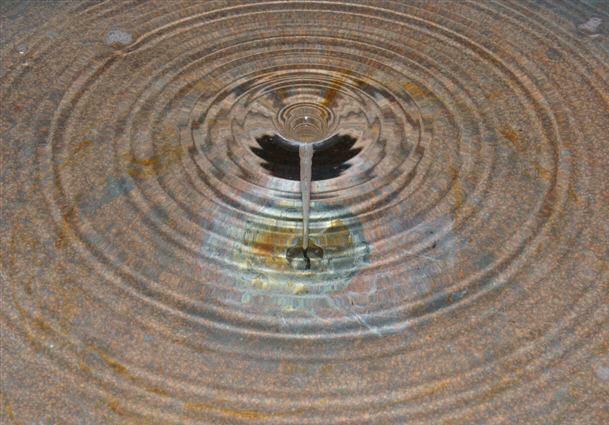 The plug had just been pulled out of the font in St Mary’s church and as the water was draining away it created this vortex. The flash on the camera highlighted the patterns. Everyone must still remember the terrible disaster suffered by the people of Haiti in January of this year, although it has since been overtaken by other disasters, such as that taking place in the Gulf of Mexico, where not only is the wild life being jeopardised for generations to come, but people’s whole existence is being wiped out. And of course, now the tragic events which took place in West Cumbria are proving hard to make sense of, to understand. How many of us when faced with disaster in our own lives will actually praise God? And yet sometimes it takes something major, even life-changing, to make us focus on what is genuinely important in our lives, and to be able to see God’s hand pointing us towards the right direction whilst giving us the strength to carry on. This doesn’t happen over night, and for a while, sometimes quite a long while, most of us seem to get caught up in the vortex of the disaster and not see past it. The world becomes full of anger, violence and recriminations, and our loving God appears to be forgotten and to have forgotten us. It is difficult to understand that God is in that vortex with us, watching, caring and still loving us, waiting for us to love him back. So in spite of everything, God is here and it is up to us to find him! Not in the noise and business of our daily life, with all its demands on us, but in quietness and in prayer. There are lots of places in the Gospels where we are told that Jesus went away to a quiet place and prayed; isn’t this one way that we can try and become closer to him? I know it is not easy, there are so many things crowding our minds, niggling doubts that we should be doing a million other things rather than just sitting, but how can we find God’s strength or consider him ‘a refuge in the day of our distress’ if we do not spend time with him? We all know that a good sing-along cheers everyone up, and when we are feeling overwhelmed by problems, singing praises to our God is uplifting and fulfilling, especially when surrounded by other people who are also worshipping and showing us they care. God’s love is there too. St Lawrence’s Fête is on Saturday 3rd July starting at 1.00pm at Swindon Village Hall and Playing Fields. Many attractions and displays throughout the afternoon. Admission 50p (children free) by programme or on the gate. From the proceeds of the June bakestall we sent £25 to SOS Children’s Villages, a charity with which we have had a long-standing connection, and £15 to The Smile Train. The July bakestall falls on the G-M team on Sunday 18th July. We all have a break in August when there is no bakestall. Thank you everyone for all your support for our charities. There is a Deanery MU coffee morning on Saturday 24th July at the Parish Centre, Charlton Kings. Cake and Bring and Buy stalls. 10.30am – 12 noon. Money raised will go towards the MU ‘wheels appeal’, providing vital transport where needed. The Prestbury MU outing is to Lichfield Cathedral on Tuesday 27th July. The coach is fully booked and Marion Beagley has all the details. There is a Garden Party (by invitation of St Matthew’s MU) on Wednesday 28th July 10.30am – 12 noon. Cake stall. Help is needed at Greenbelt on Bank Holiday Monday for the MU stand. A visit to Cheltenham Synagogue has been arranged for members of the North Cheltenham Team Ministry. The visit will take place on Tuesday 27th July at 7.00pm. Everyone is welcome to join the group but please telephone or email me by Thursday 22nd July to let me know that you intend to come. This will enable me to give the synagogue some idea of numbers. If there are too many takers I will arrange a second visit! A minimum donation of £2.00 will be requested from all adults, so that we can make an appropriate donation to the synagogue which has recently had to spend a lot of money on roof repairs. The Synagogue is in St James’ Square and there is good parking opposite. I shall be opening the Children’s Society boxes during July and August. If you have a box, please give it to me after Celebrate! or before the 11 o’clock service. Alternatively contact me to arrange for me to collect it. I have also had a letter from the Children’s Society asking for more donations for their Cheltenham shop. Details are on a poster in the church porch. On Sunday 29th August at 6.30pm we are holding a North Cheltenham Team ‘Songs of Praise’ in St Mary Magdalene’s church, Elmstone Hardwicke. All are very welcome at this service. There will be no other evening services in the Team that day. On Saturday 11th September, the Gloucestershire Historic Churches Trust (Reg. Charity No. 1120266) is holding its annual sponsored Ride and Stride. If you would like to take part in this event, either riding your bike (or horse) or on foot, please ask for a sponsorship form from Nigel Woodcock at St Nicolas’ or Phil Dodd at St Mary’s. Riders are encouraged to seek sponsorship and support from both the church and wider community. Money raised goes into the coffers to help pay the costs of maintaining the fabric of our churches within the county. Half the money goes direct to the GHCT and the other half to the church or chapel nominated by the participant – in our case usually to either St Nicolas’ or St Mary’s. If you, for whatever reason, cannot take part this year, do please sponsor someone who is. Our Parish Autumn Fête will be on Saturday 11th September on the Scout Field, The Burgage, Prestbury. If you can help with any of the stalls or games, please put your name on the lists in the churches.